3-month-old Pyal Lima, in the arms of her mother, Sor Sreyna, has been granted an identity thanks to the birth certificate that her father is holding. Imagine: neither you nor your neighbours have a radio or television. You have only a basic level of education. Your livelihood is dependent on the rice and cassava that your husband farms on his modest plot of land. If rain is minimal during the cultivation season, then crop production will be poor. If your harvest is insufficient, it is likely that your family members will frequently experience going to bed hungry. Your level 1 ID Poor Identification Card signifies that your household is at the lowest strata of poverty. Additionally, the day is nearing that you will go into labour, and until recently, you believed that your sole option was to give birth traditionally at home without a skilled attendant, rather than at a quality healthcare centre. Toun Ty’s hand is one of the first to shoot into the air, holding his chalkboard proudly aloft. It's early morning at Leok Cheas Primary School in Preah Damrey commune, Kampong Thom Province, and Grade 4 students are eagerly tackling maths problems on their individual chalkboards. Their teacher, Ms. Lyn, invites Ty to the front of the class to show his fellow students how he solved the exercise. Ty’s grandmother, Prum Yeap, never thought she would see her grandson flourish in school. This is because Ty has a disability that affects his mobility. Growing up in Cambodia: "Power of the Adolescent Girl"
Keo Dalis (left), is a 15 year old girl living in Toul Sambo village, Dangkor distict. Paeun Paatajeudy (right), is an 18 year old girl living in Russey Keo village, Stung Meanchey district. Both are active in UNICEF Cambodia’s Youth Representative Group proving that adolescent girls can be actors in positive change. The urban poor communities where the girls live are about a 30 minute drive or less than 20km from each other in Phnom Penh. Both communities face similar challenges for example, a lack of access in the provision of education for children that is compounded by high rates of poverty. Despite the low socio-economic conditions within their communities, they both exude “Girl Power” because they recognize girls’ rights and the unique challenges faced by girls in their community, throughout Cambodia, and around the world. Tong Soun (first right) with her 4-month-old baby in Kouk village, Ratanakiri province. Under the shade of a large tree, Tong Soun carries her 4-month-old baby in a colourful shawl. They live in the remote village of Kouk, 620 kilometres from Phnom Penh in the distant north-eastern province of Ratanakiri. 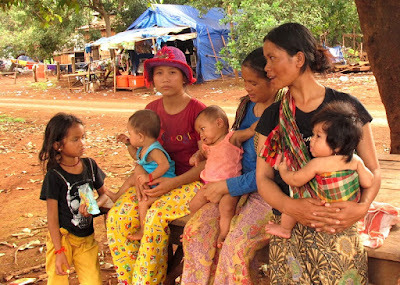 Kouk village is located in the rural district of Ou Chum, where access to health services is extremely limited, especially for expecting mothers. Aside from limited services, many people in Ratanakiri maintain the belief that traditional birth attendants, who usually have not received formal medical training, are a better option than skilled midwives in a hospital or health centre.